Home > News & Events > 2014-2015 Alumni Class Challenge results – Thank you for your support! 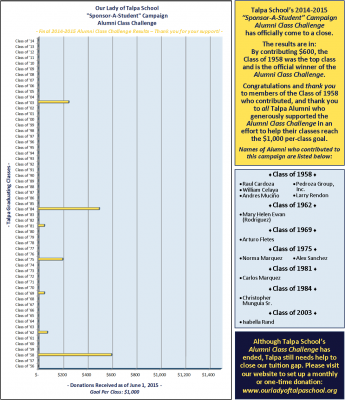 2014-2015 Alumni Class Challenge results – Thank you for your support! Talpa School has been facing a $50,000 deficit in tuition revenue. To close this tuition gap, the Talpa Alumni Association and Talpa School created an Alumni Class Challenge as part of Talpa’s 2014-2015 “Sponsor-A-Student” Campaign. (To learn more about this effort, you may read the following Letter from Our Lady of Talpa School Principal, Sister Adella Armentrout, D.C.). The goal of this Alumni Class Challenge was for each graduating class – from 1956 to 2014 – to raise at least $1,000 by May 15, 2015. The Class Challenge has come to an end, and the results are in: Talpa’s Class of 1958 drew the closest to the $1,000 per-class goal by raising a total of $600. Congratulations and thank you to members of the Class of 1958 who contributed, and thank you to all Talpa alumni who generously supported the Alumni Class Challenge in an effort to help their classes reach the $1,000 goal. Overall, alumni contributions to the Class Challenge raised a total of $1,725.00 for Talpa School, which Talpa was able to double thanks to a matching grant opportunity from the Carrie Estelle Doheny Foundation. Although the Class Challenge has ended, Talpa still needs help to close our tuition gap. Please click here to donate online today. Please specify “Sponsor-A-Student” in the “Gift Information” section of the online donation form. If you are a Talpa alumna/alumnus, please enter your class year in the “Company Name” line of the “Your Information” section. Or, click here to download a donation card to submit with your donation via mail. To view the “Sponsor-A-Student” Campaign Alumni Class Challenge final results, please click the image below. Thank you again to all of our alumni who supported the Class Challenge, and to the Talpa Alumni Association members who, under the leadership of Norma Marquez (President), helped lift this effort off the ground!